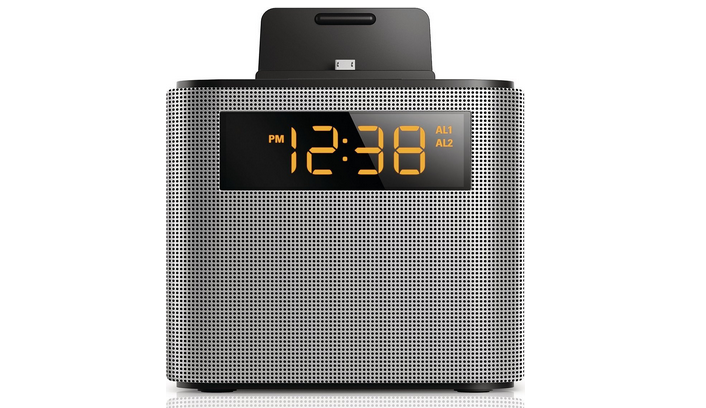 Philips AJT3300 is a docking station / alarm clock that is manufactured for Android as well as Apple products and that has 2W of music output as well as AUX and Bluetooth connections. This dock has the dimensions of 112 mm x 101 mm x 125 mm (4.4 inches x 4 inches x 5 inches) and it weighs only 400 grams (14 ounces) so it is a very lightweight product that will not take up a lot of space on your bedside counter or work desk. This docking station has a cube like shape with rounded corners and a front facing speaker. The whole device is made from plastic and it has a black color but that front facing speaker has a perforated cover and it is in a grey color. At the bottom of the device there are 4 rubberized feet so this dock would not slide around on your desk or any other surface and it is held together with strong screws and that means it can be dismantled easily if any repairs are required. The overall style and feel of this dock is great and you can clearly see that Philips has put their top design as well as technical specialists together in order to created this AJT 3300 model. As the technical details goes as I mentioned earlier this docking station has a 2 W mono power output so it is not a particularly loud speaker but it has enough umpf to get you up in the morning with radio or with your favorite music from your Smartphone. This Android docking station runs on AC 100-240V power input but also has two AA batteries that will store your clock timer as well as other digital setting if there is a power outage of some sort. There is also a radio FM Tuner built into this android clock radio that has a range from 87.5 to 108 MHz and it also has an option to preset up to 10 radio stations. Also in the technical details I must include that front facing LED diode display that this device has as it is fairly large and has 24 hour time format with Amber color output. There is also that Bluetooth hands free connection that allows you to play music while your phone is not docked and allows you to do that in a 10 meter radius. There is also that 3.5 mm AUX line in that allows to play music from any Smartphone and music player but you should also know that this dock supports streaming profile like A2DP, HFP and AVRCP. Microphone – This alarm clock dock has a unique feature in that it has a built in microphone that will allow you to make hands free calls without lifting your Smartphone from its stand. This feature is very convenient as you will not need to constantly dock and undock your phone if you get a lot of phone calls. Sleep timer – There is also a sleep timer that allows you to set time intervals (15 min, 30 min, 60 min, 90 min, 120 min) after which your clock radio will automatically turn off. This is a great way to go to sleep as you can be certain that the music will automatically turn off and you will not be wasting electricity and will not have to wake up in the middle of the night thinking that your alarm just started. Dual alarms – Dual alarm function is great if you and your partner have different morning routines and need to wake up at different intervals. This function allows to pre-set two different alarms and hitting the snooze or turning off the first alarm will not affect the other! Snooze – Snooze option is pre-set to 9 minutes and is useful if you want to sleep for a bit longer before getting up. It is a shame that you can’t adjust the snooze time but 9 minutes seems like a reasonable time! Gentle wake – Gentle wake is another feature that allows you to wake up gently by slowly increasing the sound of the alarm. This will allow you to wake up more refreshed and in a better mood as you will not have to jump out of bed with an uncomfortably loud alarm or have to be late for work because of too quiet alarm. If we move on to the buttons then we can see that at the top of this dock there are 9 buttons that will allow you to control everything starting from the radio frequencies to volume and also answer those remote calls. At the front the biggest button is that snooze option and it is designed to be at the most comfortable position for you to easily press if you want to sleep a little bit more. If you look at the back of this device you will see a chord holder and an USB port and that means that you will be able to plug in different chords depending on what device you want to dock here. In the package there are three different chords that are Apple Lightning as well as 30 pin connectors and also a micro USB connector for your Android devices. These different connection plugs can be easily changed and that wire will be neatly tucked into that chord holder at the back. At the top at the back there is the main feature and it is that docking port with those interchangeable cradles. This spot is designed to hold your phone upright in a slight angle for optimum viewing angle as well as stability. There is also a small rubberized knob that will hold your device in place and will not allow it to slip when this dock is moved around. Overall this is a really nice alarm clock dock from Philips and I can highly recommend it to any Apple or Android user as it has a lot of functionality and style but it is also cheap enough to not put a dent in your monthly budget. I am having trouble with the alarm clock volume it is very love. Bluetooth wont stay on so at least my music can wake me. It would work before. I can hear the alarm because I test it but its very low…please help! Hi Marie, I would suggest you to contact the manufacturer or re-seller and get it fixed uder warranty as it sounds like something has broken inside the device itself and you will not be able to fix it that easily.